Perennial lupine is short-lived, with each plant lasting for two or three years in the garden. Yet it readily self-seeds, so once planted, it continues to reproduce and thrive for many years. 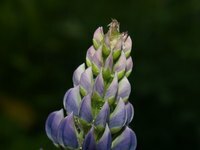 Lupine can be started from seed directly in the garden, but if you desire more control over the design of your planting, try transplanting lupine into the garden. Lupine does not tolerate root disturbance when transplanting, so use peat pots to start the seeds indoors in the spring. Fill a bowl with warm water and place the lupine seeds in the water. Soak overnight or for eight hours prior to planting. This is necessary to break the seed's dormancy. Fill peat seed pots with a moist potting mix. Fill with mix to within ½ inch of the pot's rim. Sow one to two seeds per pot. Plant the seeds to a ¼-inch depth, then cover the pot with a plastic bag. The bag retains moisture during germination. Set the pots in a warm, 65- to 75-degree room to germinate. Remove the plastic bag once sprouts appear, approximately three weeks after sowing. Transplant the lupine to a full-sun, well-draining garden bed once the seedlings are 3 inches tall and have produced their second set of leaves. Work a 2-inch layer of compost into the bed prior to transplanting to improve soil drainage and nutrition. Dig planting holes as deep as the peat pot and slightly wider. Space the planting holes 1 foot apart in all directions. Tear the top rim off the peat pot and discard. Set the pot in the planting hole so the top of the pot is just under the soil surface. Refill the planting hole with soil. Water the garden bed thoroughly after transplanting the lupine. The peat pots break down in the soil and the long tap root of the lupine plant easily pierces the bottom of the pot. Start lupine indoors one month before the last expected spring frost in your area. Use peat pellets instead of peat pots and soil. If purchasing lupine seedlings from a garden center, only purchase those planted in plantable peat pots. Those sold in plastic containers likely won't survive the transplanting process. Lupines come in many types, but most are perennials that prefer full to partial sun, fertile soil and consistent moisture.